Discussion in 'Cold Steel Knives' started by jlauffer, Apr 2, 2018. With the demise of the Cold Steel Forums, I am attempting to recreate the History threads that I had done over there. First up is the Tantos. Hopefully this can be made into a sticky. This will focus on the “classic” CS Tantos, from the beginning until they discontinued the Made in Japan knives in about 2016. This will not include the 3V Nightfall Series Tantos or Taiwan San Mai Tantos, or other tanto models like the newer Recon Tanto, Kobun, and Oyabun. My plan is to paste in all the text, and then populate the pics, so bear with me. Hoping to include more pics this time. Most of the pics are from knives I either own or bought and resold. Some of the pictures are not great, as the CS Forums site had size limits, and I wasn’t going to take all new pics…I may replace some here and there as I go. I am also adding more detailed text descriptions of the markings, instead of just relying on the pix. That way if the pix are lost there is still something to go by. 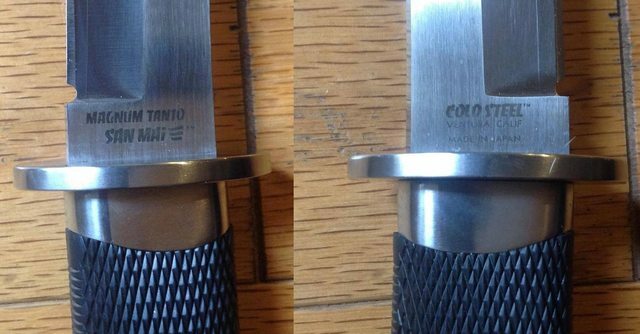 Please note that in some places I use the word “logo”, like COLD STEEL logo, or TANTO logo. This means they use the actual Cold Steel logo font, rather than a regular font. For everything else I use upper/lower case letters to indicate what the marking says, but the fonts and size may vary. The info presented is based on what I’ve learned over years of collecting and research. I can’t guarantee that it is all 100% complete and accurate, and I welcome any additional info and corrections. Until recently, this was thought to be the CS equivalent of a unicorn. Sure, we had the magazine ad from the early 80’s that shows it (and a Mini version), along with the Urban Series, but no one had actually seen one. That all changed when forum member The Whip found and bought one at a show in April 2018 (and special thanks to The Whip for the photos). 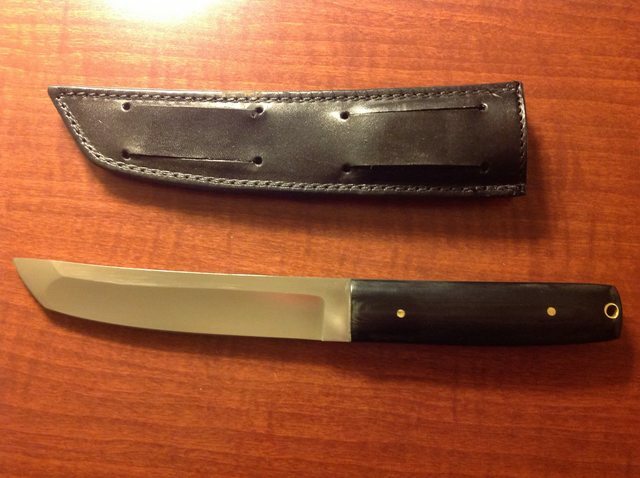 It has a pinned micarta handle and no guard. Period: 1981 to 1983? 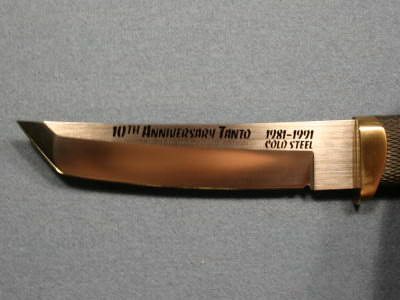 Cold Steel started in 1981, and the 2006 catalog says it’s the 25th anniversary of the Tanto, so the 1981 start makes sense. But not sure when the design changed to the more familiar brass/Kraton version. I have a catalog that I was told is from 1984 (it is not marked) and it has the brass/Kraton version, so I am guessing this original version only lasted a few years. 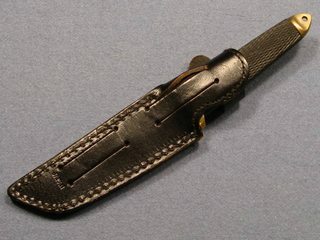 Sheath: Black leather “pouch” style with 2 sets of slits on the back to pass a belt through, allowing it to be carried at 2 different heights. No retention strap. Period: 1984? – 1991. I have a catalog that I was told is from 1984 (it is not marked) and it has the brass/Kraton version, so they at least go back to 1984. This version lasted until 1991 and then the guard and pommel were changed from brass to stainless in 1992. 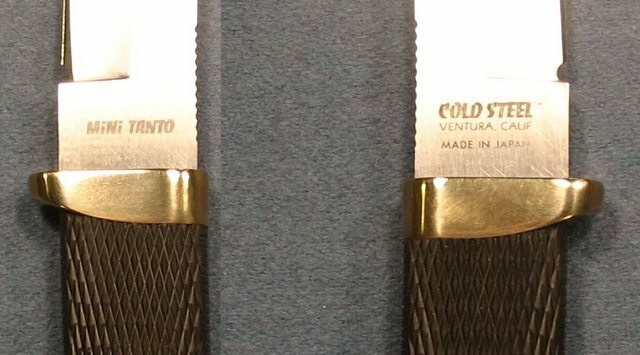 Blade Steel: Cold Steel’s "400 Series Stainless". 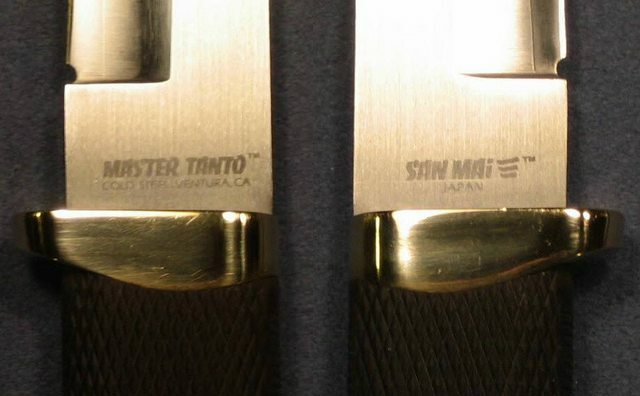 There were also some regular Tantos with San Mai III blades, prior to being called Master Tantos. The markings were the same as the regular Tantos (#3 below), so the only indication is the lamination line. 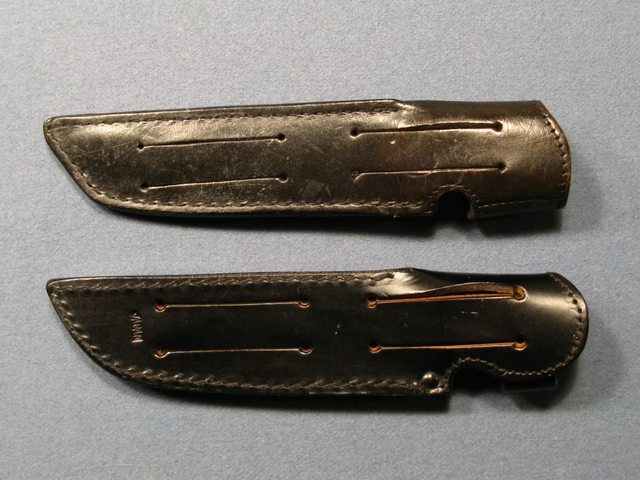 Sheath: Most are black leather with Velcro strap and 2 sets of slits on the back to pass a belt through, allowing it to be carried at 2 different heights. There may also be some later ones with a single belt loop, which was standard after the transition to the 6” version with stainless fittings. Both versions should be stamped JAPAN on the back. I also have one, and have seen a couple others, that have a wider retention strap…these are very rare. 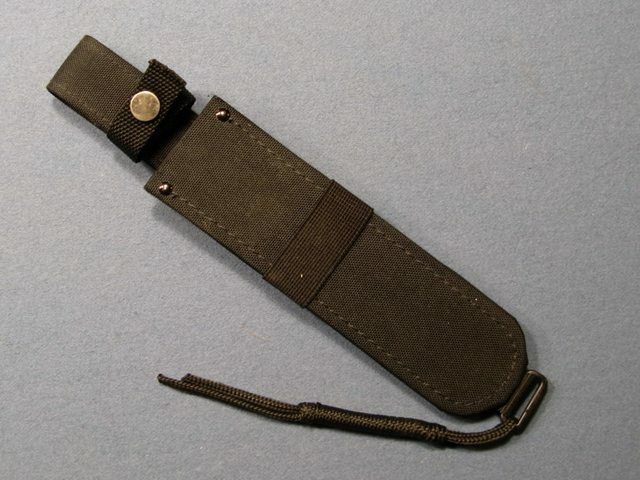 There were also some Kydex sheaths sold as accessories…see the Special Ops/Master Ops Tantos below for an example. 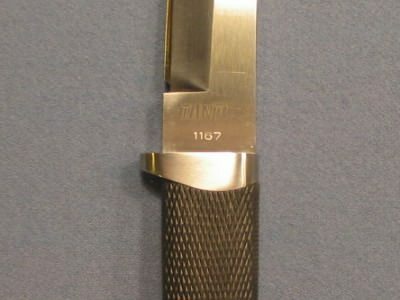 Misc: One special version of this Tanto was made for the cutlery company Hoffritz. 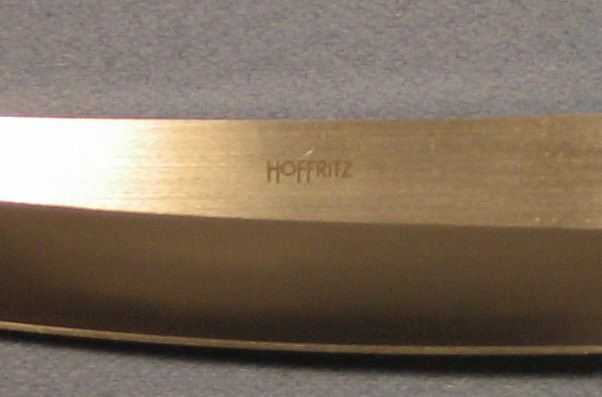 It is identical to the standard Tanto except it also has the Hoffritz logo on the blade. Another special version was a Cutlery Shoppe exclusive with stainless fittings...it has its own post below. There is also a 10th Anniversary special version that is serial numbered, with Lynn’s signature on the blade, and includes CoA. I think most of us are familiar with the current style Recon Tanto, but few realize that before that version there was this one. It was basically just a regular Tanto, but with a non-reflective bead-blasted finish...not only the blade, but the guard and pommel too. However, the pommel was a “dome” shape rather than the normal “skull-crusher”. Period: 1986? – 1987? I have a copy of National Knife Magazine from April 1987 that has an article about the CS Tanto, and includes the Recon Tanto. It was basically introduced as a lower cost alternative to the regular Tanto (the article mentions how the regular Tanto was $139.95 and the Recon Tanto was $89.95). Not sure how long they were produced, but they are not shown in the 1988 catalog. 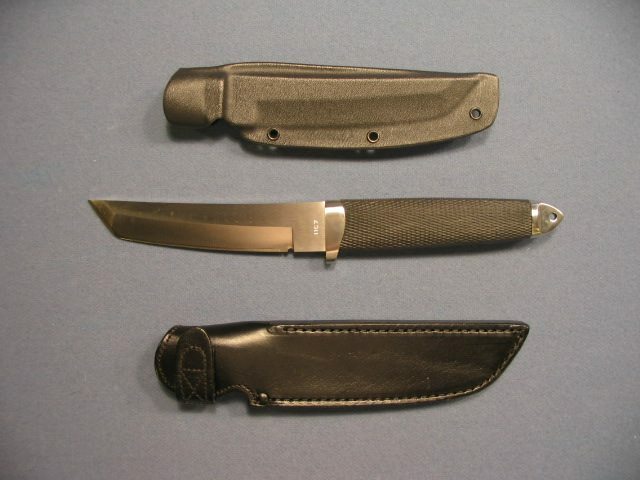 Another interesting tidbit from the article is that the Recon Tanto was only available from Matthews Cutlery in Decatur GA.
Blade Steel: Cold Steel’s "400 Series Stainless"
Sheath: 2 versions that I know of…1) typical black leather sheath with Velcro strap and 2 sets of slits…2) Cordura/nylon sheath that was also available with a shoulder harness. EDIT: Based on The Whip's research, looks like the Cordura sheath was offered through Cutlery Shoppe. Rowan McDirk, DocJD, Kels73 and 3 others like this. 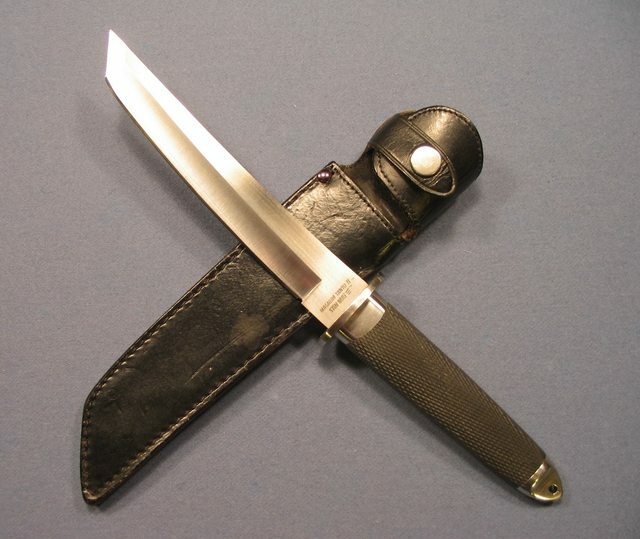 Period: Not exactly sure when they started using the Master Tanto name, as there were regular Tantos with San Mai III blades. It is in the earliest archived catalog, which is 1988, but may have been around before that. Lasted until 1991 and then the guard and pommel were changed from brass to stainless in 1992. This is one of the only cases I know of where they only say Japan, instead of Made in Japan. 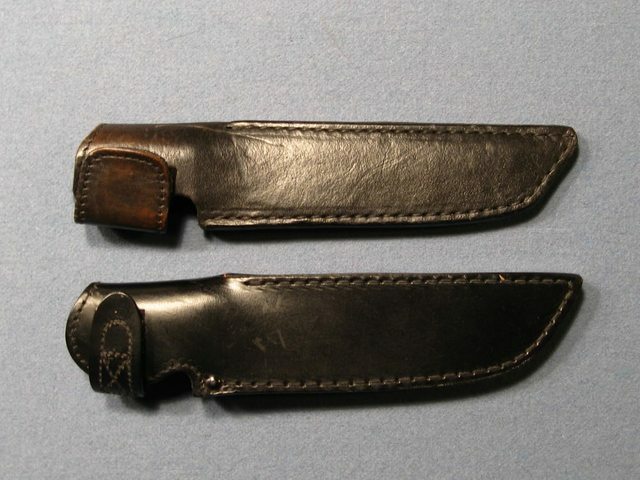 Sheath: Most are black leather with Velcro strap and 2 sets of slits on the back to pass a belt through, allowing it to be carried at 2 different heights. There may also be some later ones with a single belt loop, which was standard after the transition to the 6” version with stainless fittings. Both versions should be stamped JAPAN on the back. There were also some Kydex sheaths sold as accessories…see the Special Ops/Master Ops Tantos below for an example. 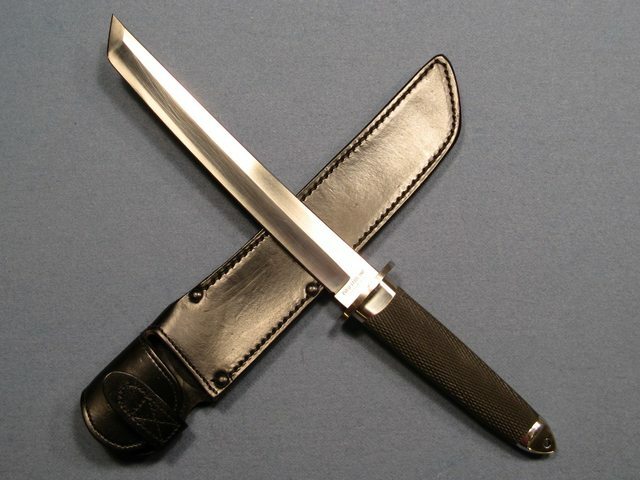 Misc: One special version of this Master Tanto was as part of the Emperor Collection, which was a set that included a Mini Tanto, Master Tanto, and Magnum Tanto, all in San Mai steel and with raised spines. All had matching serial numbers with certificate of authenticity, among other goodies (bamboo mat, fan, tea cups, etc). Another special version was a Cutlery Shoppe exclusive with stainless fittings...it has its own post below. This is one of my favorites because it has a great backstory. 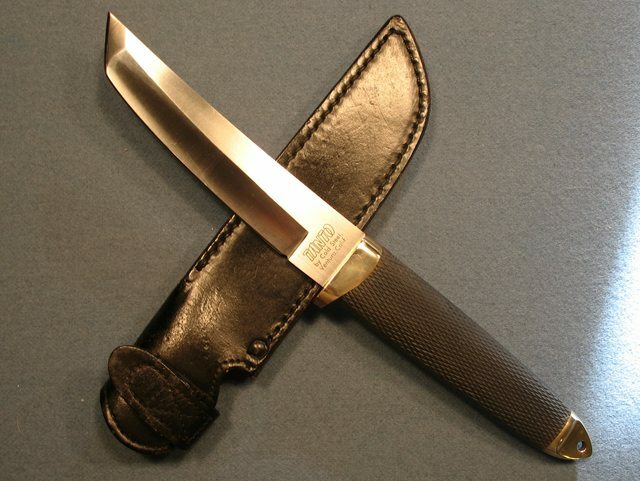 Jeff Loffer at Cutlery Shoppe loved the Tanto, but didn't care for the brass fittings. 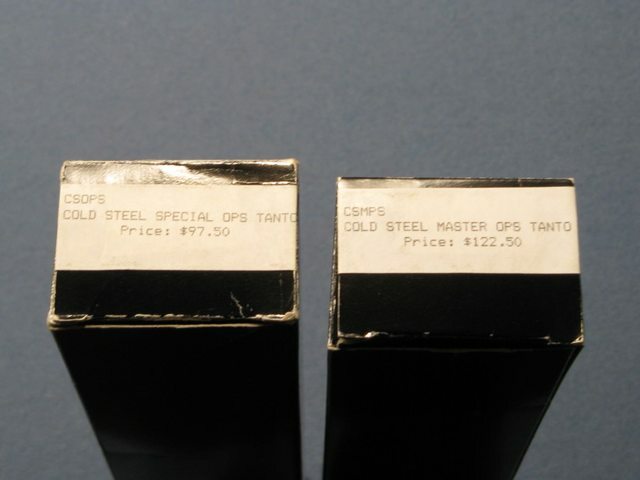 So he had Cold Steel make a couple thousand Tantos with stainless fittings and had them serial-numbered. 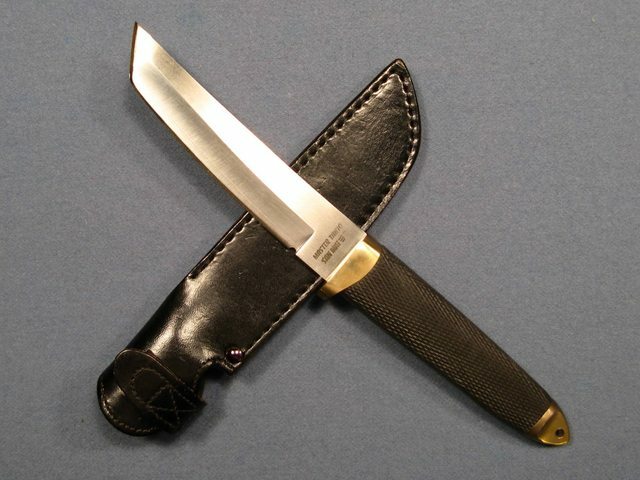 He also added in a Kydex "Pull Dot" sheath along with the stock leather sheath, and sold it as the Special Ops Tanto...a Cutlery Shoppe exclusive. He did the same with the Master Tanto too, and called it the Master Ops Tanto. 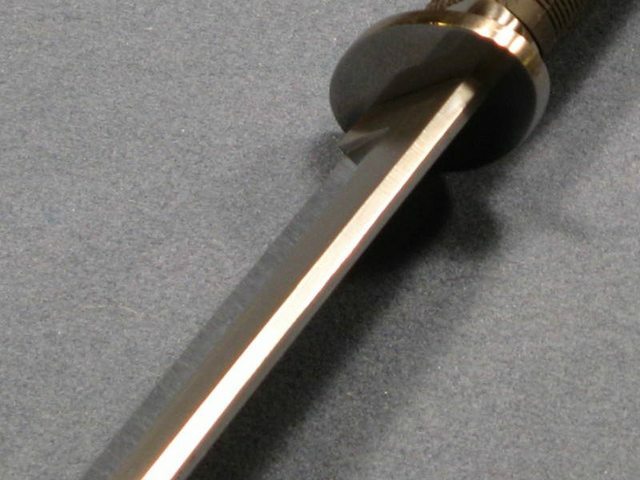 time Cold Steel only offered their Tanto with brass guard and pommel. In another e-mail, he goes on to "hint" that the reason Cold Steel changed to stainless was because of the popularity of the Special Ops version. Don't know if it is true or not, but it certainly adds to the lore. Unlike the stainless models that Cold Steel would later release, the guard on this one is the same shape as the brass version, but just made of stainless instead. This was actually an easy thing to do, since the Outdoorsman used the same guard at the time. 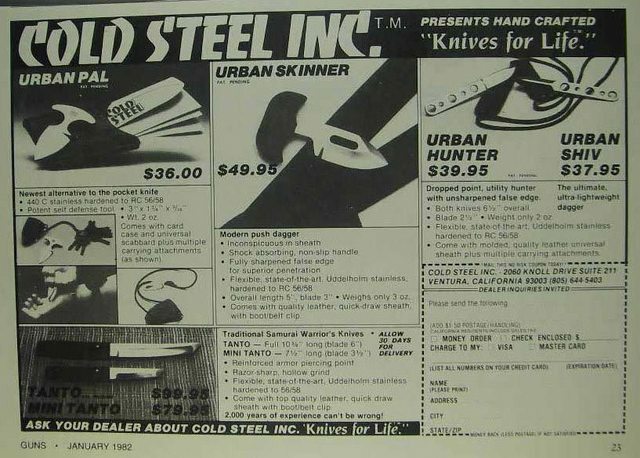 Period: Late 80's - Early 90's, but definitely prior to Cold Steel's "official" switch to stainless in 1992. 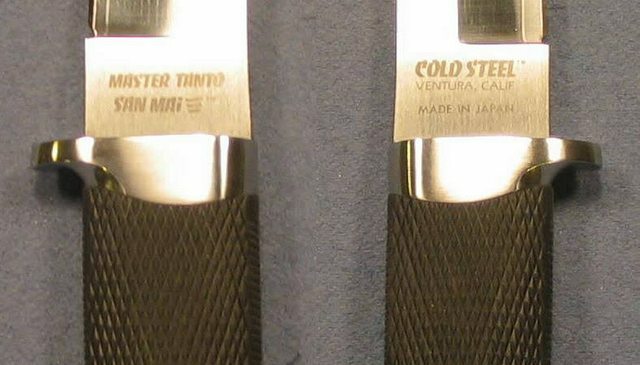 Blade Markings: Same as standard Tanto/Master Tanto, but with a serial number engraved into the blade on the TANTO/MASTER TANTO side. The one in the pic is #1167. 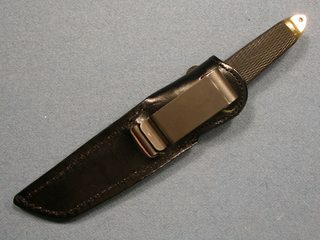 Sheath: Black leather with Velcro strap and 2 sets of slits on the back to pass a belt through, allowing it to be carried at 2 different heights. Also included Kydex Pull Dot sheath. Misc: Also came with a cardboard blade sleeve with matching serial number…many of the ones I’ve seen for sale are missing this. Also see many that are missing one of the sheaths. This is the only serial-numbered Tanto I know of other than those in the Emperor and Imperial Collections, and the 10th Anniversary Tanto. Rowan McDirk, DocJD, d762nato and 2 others like this. Most of us are probably familiar with the Magnum Tanto II, IX, and XII, but first there was just the plain ol' Magnum Tanto. It is closest to the Magnum Tanto IX in size. 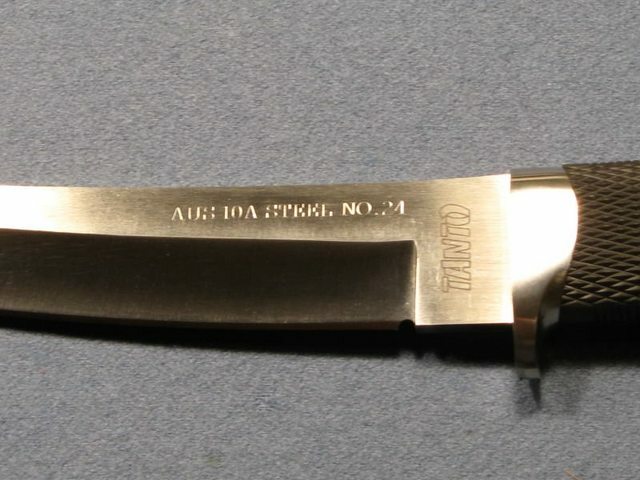 While the Mini Tanto, Tanto, and Master Tanto still had brass fittings at the time, the Magnum Tanto had fittings made from 300 series stainless. It also introduced the full "tsuba" style oval guard, that would find its way onto the later Mini Tanto and Tai Pan. 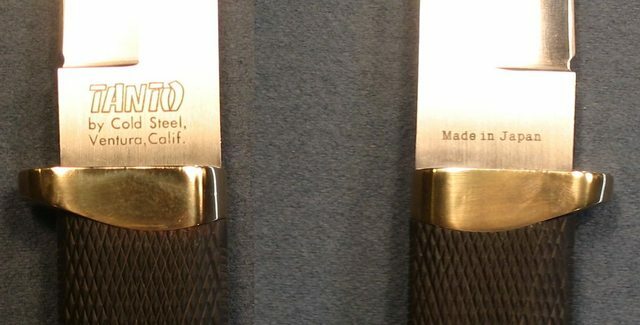 Blade Steel: Cold Steel’s "400 Series Stainless" and San Mai III. Sheath: Black leather with Velcro strap, and 4 rivets that also hold belt loop. 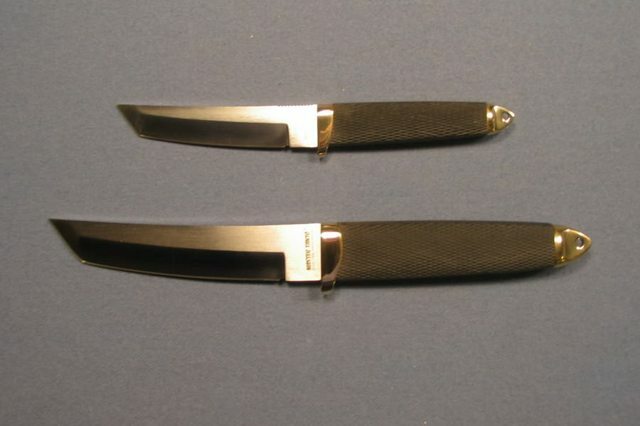 Misc: One special version of the Magnum Tanto was as part of the Emperor Collection, which was a set that included a Mini Tanto, Master Tanto, and Magnum Tanto, all in San Mai steel and with raised spines. All had matching serial numbers with certificate of authenticity, among other goodies (bamboo mat, fan, tea cups, etc). This is the only Magnum Tanto I know of that had brass fittings. The brass Mini Tanto is exactly that, a 2/3 scale model of the original brass Tanto. Unlike all the other members of the Tanto family that have the same handle and just different length blades, everything on the Mini Tanto has been shrunk down (I actually find the handle a little too skinny to be comfortable). In fact, without a point of reference for scale, it could easily be mistaken for a regular size Tanto...except it has some jimping on the blade spine. See pic for comparison to Master Tanto. Period: Not exactly sure when it was first released. It is in the earliest archived catalog, which is 1988, but may have been around before that. Lasted until 1990 and then the guard and pommel were changed from brass to stainless in 1991. Sheath: There are 2 versions that I know of…1) black leather with Velcro strap and 2 sets of slits on the back to pass a belt through, allowing it to be carried at 2 different heights…2) black leather with Velcro strap and metal belt clip. 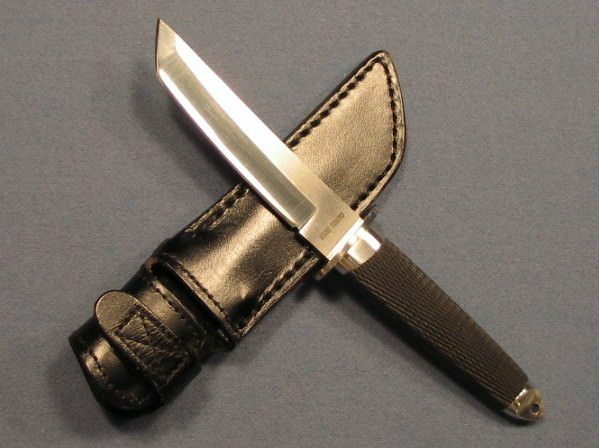 Misc: One special version of this Mini Tanto was as part of the Emperor Collection, which was a set that included a Mini Tanto, Master Tanto, and Magnum Tanto, all in San Mai steel and with raised spines. All had matching serial numbers with certificate of authenticity, among other goodies (bamboo mat, fan, tea cups, etc). 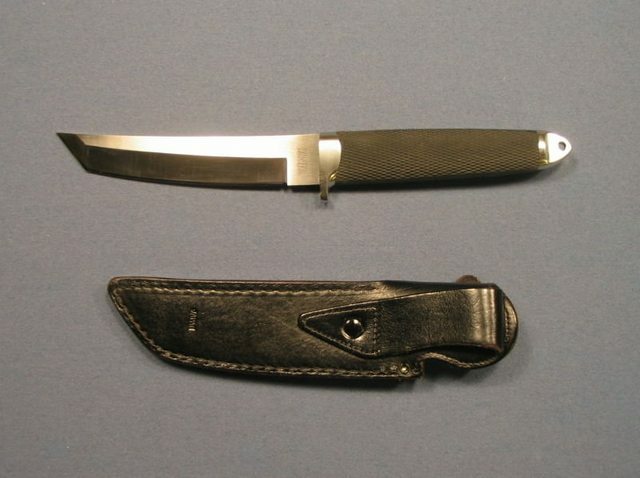 This is the only version of the Mini Tanto I know of that had a San Mai blade. 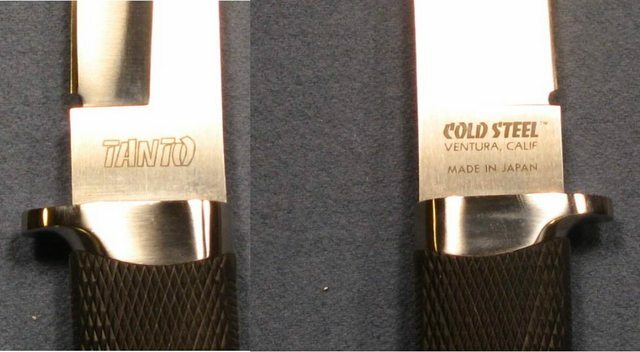 In 1992 the guard and pommel on the Tanto, Master Tanto, and Mini Tanto were changed from brass to stainless, similar to the Magnum Tanto (but still only the half-guard on the Tanto and Master Tanto...strangely the Mini Tanto changed to a full guard). The shape of the guard also changed, becoming more sculpted and less "blocky". Blade Length: 6". 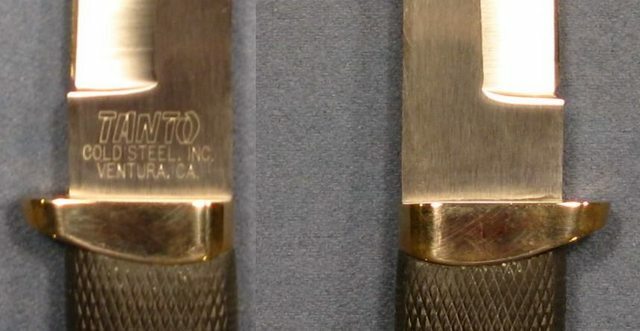 It appears that most of the extra 1/4" of length (compared to the brass versions) came from changing the angle of the tanto point. Sheath: Black leather with Velcro strap and single belt loop. 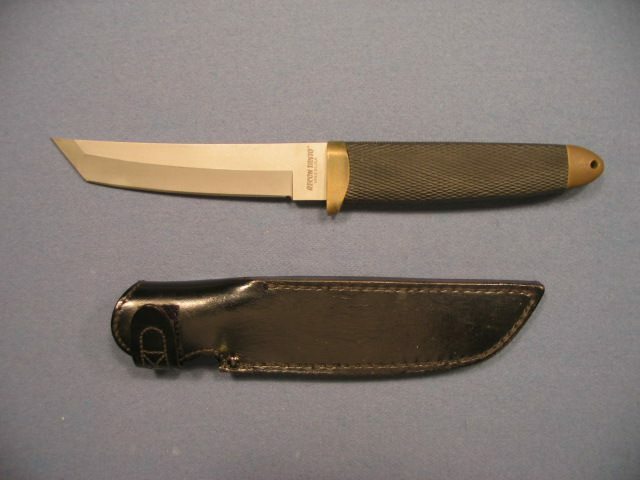 Misc: One special version of this Tanto had an AUS 10A blade, and was limited to only 40 examples. It was available in the 2001 Christmas Flyer. This has to be one of the rarest CS knives ever made. Mine is #24, and have only seen one other, which was #15. 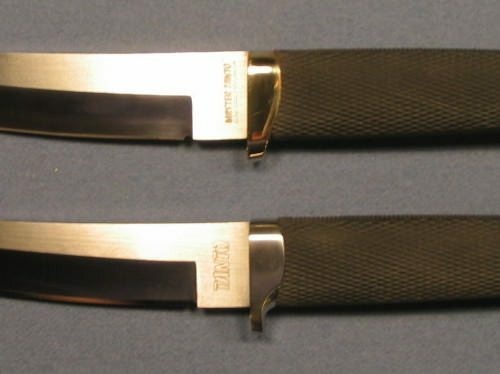 In 1992 the guard and pommel on the Tanto, Master Tanto, and Mini Tanto were changed from brass to stainless, similar to the Magnum Tanto (but still only the half-guard on the Tanto and Master Tanto...strangely the Mini Tanto changed to a full guard). The shape of the guard also changed, becoming more sculpted and less "blocky". See comparison pic in the stainless Tanto post above. Sheath: Black leather with single belt loop. Originally had Velcro strap, but then changed to a snap. This first appears in the 2011 catalog. The Magnum Tanto II replaced the Magnum Tanto in 1990. Along with the blade length difference, the other main difference is that it no longer has the raised spine. 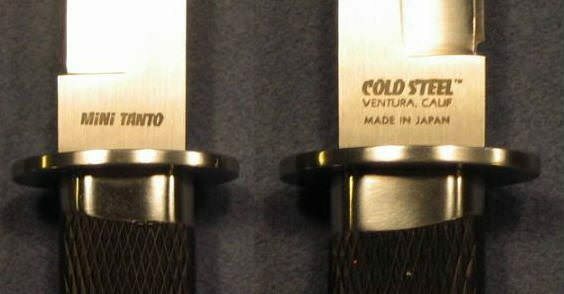 Blade Steel: Cold Steel’s “400 Series Stainless” (1990 – 1994) and San Mai III (1992? - 2015). Not exactly sure when they started offering it in San Mai III…the 1990 flyer only mentions 400 Series Stainless, while the 1992 catalog has both 400 Series Stainless and San Mai III versions. 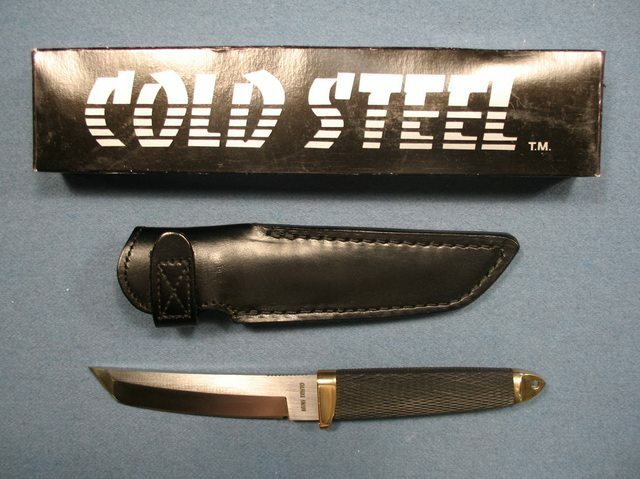 COLD STEEL, INC (in plain block print, not logo font). 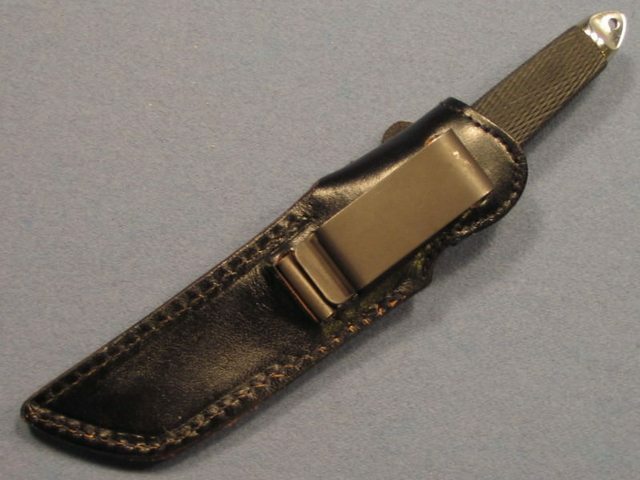 Sheath: According to the 1990 flyer, it originally had a black Cordura/nylon sheath. At some point this changed to black leather with a snap strap (not Velcro). 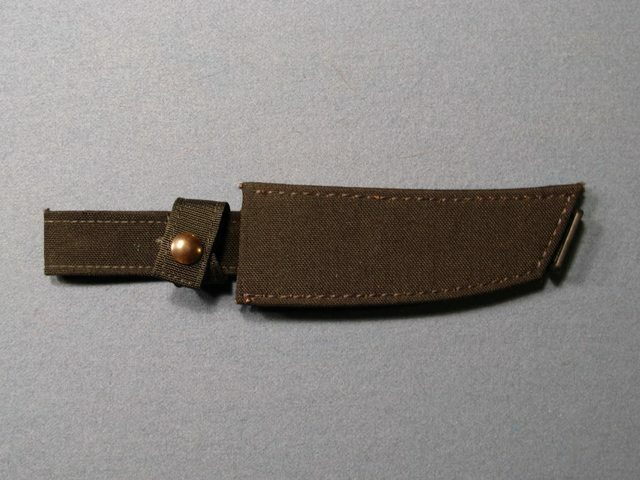 Not exactly sure then this happened, but the 1992 Special Projects catalog I have shows the leather sheath, so looks like the Cordura sheath only lasted a year or two. 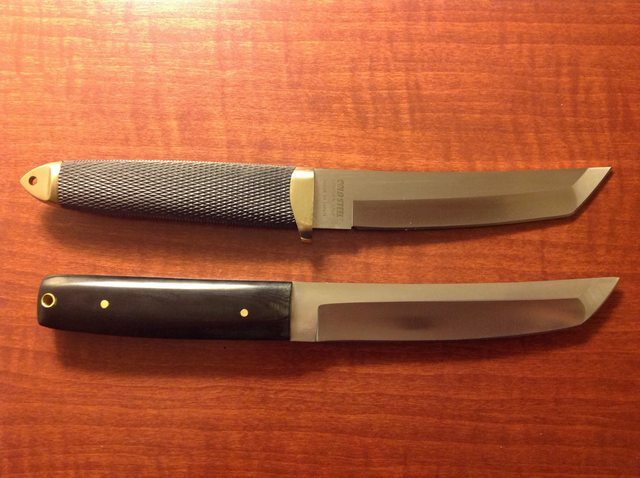 Misc: Seems to be a lot of fake Magnum Tanto II/IX/XII’s out there. There are a few things to look out for…1) No lamination line on knives marked as San Mai III…2) I see many that just say “JAPAN” instead of “MADE IN JAPAN”…3) Bad fit/finish, such as rounded corners, gaps, etc…4) Leather sheath with Velcro strap instead of snap. 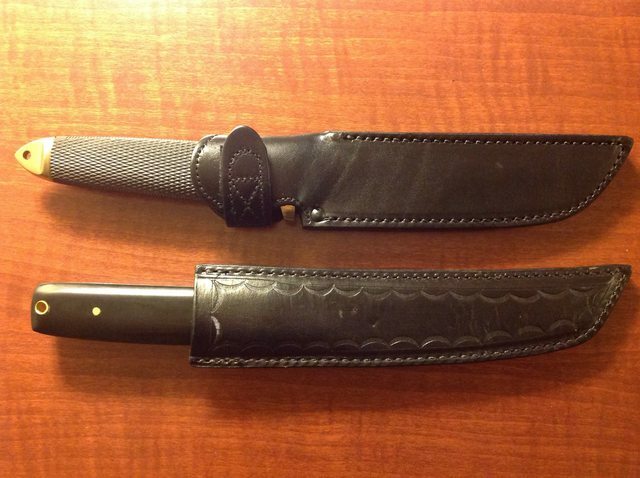 Velcro was only used on the original Magnum Tanto sheath back in the 80’s…5) Many fakes come with plastic sheaths. This used to be an obvious red flag, as the Magnums always came with leather sheaths. But the waters have been muddied with the introduction of the 3V Nightfall Series Tantos (2015) and Taiwan San Mai III Tantos (2018), which come with plastic sheaths. There isn't much mystery to these guys. They are just longer versions of the Magnum Tanto II, available in 9" (IX) and 12" (XII) blades, and as far as I know they have always been San Mai III steel exclusively. They came with black leather sheaths, with snap straps (not Velcro). They first appeared in the 1998 catalog, and were last seen in the 2011 catalog. Strangely, when the Tanto, Master Tanto, and Mini Tanto got updated with stainless fittings, only the Mini Tanto received a full oval guard like the Magnum Tantos. Also, the jimping that was on the brass version was removed. Sheath: Black leather with Velcro strap and metal belt clip. Lapedog, J.Mattson, d762nato and 8 others like this. Pretty much done with this one...will start working on Trail Masters and Push Knives. Enjoy! d762nato, DocJD, Man with no name and 1 other person like this. Many thanks for your efforts. Good to see your getting your "Histories" over here now that the CS Forum is no longer available. good work Sir. thanks for taking the time for us all. greatly appreciated. Thanks for doing this. I learned a lot from your "history" threads on the old forum. It's good to have the information here for reference. Awesome and you even did some updating too! Let's get this stickied! Not sure how to do it, anybody know how? Always haunts me to see that inverted tanto on William Dafoe in "Platoon" the movie. 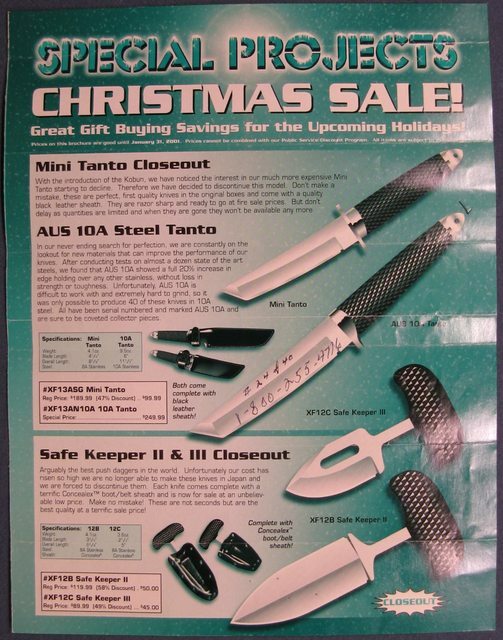 IMHo, that's made the best CS tanto still advert ever! What he said, awesome work and Thanks for taking the time to allow everyone the chance to look back in time and be able to locate and research these cool Tanto's of the past. There is one more version of the Magnum Tanto that falls in between the version 1) and 3). This is a San Mai III steel, raised spine, but the hilt markings are from the later example. I sold this recently on BF. Thanks, but I believe that matches the #3 marking that I show for the Magnum Tanto...maybe you were looking at the Magnum Tanto II? Yes, it matches 3) AND 1) which uniquely has the raised spine. Nice work mate can’t wait for the Tai Pan history. Just posted the text for the Trail Master history...will add pix soon. Not sure I'll get to the Tai Pan, but there's not much mystery there...started around 1995 as AUS 8A, changed to San Mai III in 2007, and then changed again to 3V in 2015 as part of the Nightfall Series. Yeah true, hopefully the new san mai ones are as good as the Hattori ones! Man with no name and nephron like this. Wanted to post this here as well as in the Rare Gems thread. 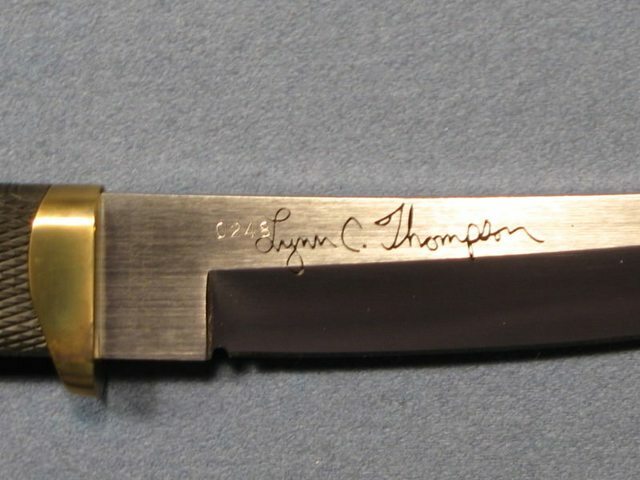 I had the privilege of speaking with Lynn Thompson for a while at Blade Show this past weekend and was able to ask him about the original Tanto that I purchased back in March. He told me that knife is one of approximately six that he had hand-made as pre-production prototypes prior to the development of the Kraton-handled, guarded Tanto model that we know so well. 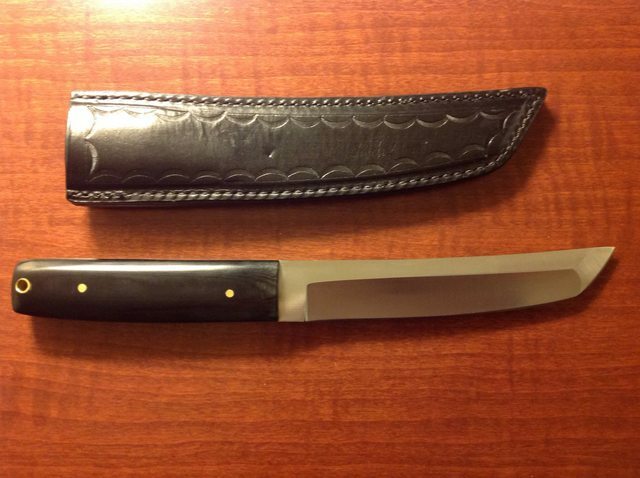 He said the knife is circa 1980, and the sheath was by Ruiz Industries, Inc., out of Glendale, CA, which made many of the early Cold Steel sheaths. I didn't ask who the knife maker was. I realize that I probably should have, but Lynn didn't offer and I know that he prefers to keep those details under wraps. nephron, Man with no name and jlauffer like this. I use to own one of the original Recon Tantos just like the one you have pictured. I bought it at a cutlery store in a mall located in Kennesaw, Georgia. Timeframe would of been late 1986 or early 1987. Didn't realize what I bought was less common than the original, bought it because it was cheaper.